For Chicago firms struggling to hang on to their rainmakers, the culprits to blame may be out-of-town firms opening branch offices here. Two legal recruiters say the accelerating invasion is driving up the value of Chicago lawyers with large books of portable business. 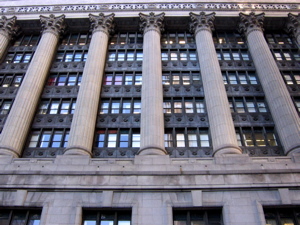 Also, according to one recruiter, it’s putting pressure on Chicago’s mid-sized firms. Forty-eight out-of-town law firms have opened offices in Chicago since the mid-1980s, according to data kept by Alan J. Rubenstein, executive vice president of Chicago Legal Search Ltd.
“The pace has picked up tremendously in the last seven years,” Rubenstein said. Twenty-six such firms opened branches here in the last seven years, or almost four firms a year, according to Rubenstein. “All these branch offices are competing for a limited pool of attorneys that have proven their ability to consistently generate business over time,” Rubenstein said. The rainmaker competition isn’t the only effect. “The lawyers are just trading places,” Hagen noted. Early this month, New York’s LeBoeuf, Lamb, Greene & MacRae grabbed four lawyers from Virginia-based McGuireWoods LLP’s relatively new Chicago office to get started. They are Michael H. King, Keith P. Schoeneberger, Elizabeth M. Bradshaw and Spencer R. Wood, according to McGuireWoods. Rubenstein and Gary A. D’Alessio, president of Chicago Legal Search, have tracked the flow of rainmakers here to the new branch offices. Examples include Corey E. Light, whom Rubenstein described as a major rainmaker at Altheimer & Gray who left that firm before it dissolved to join Greenberg, Traurig’s Chicago office in 2003. Also in 2003, Edward G. Wierzbicki, Daniel D. Frohling, Mary E. Innis and Douglas N. Masters left Pattishall, McAuliffe, Newbury, Hilliard & Geraldson LLP, where they represented clients such as Anheuser-Busch, Borders Group, Dell, Caterpillar and Sears, Roebuck & Co. to open the Chicago office of Loeb & Loeb LLP, Rubenstein said. In 2001, bankruptcy attorneys Sheldon L. Solow and Michael B. Solow departed Hopkins & Sutter to start the Chicago office of Kaye, Scholer LLC. In one of the most publicized moves, Theodore R. Tetzlaff and Rodney D. Joslin, who had been respectively chairman of the executive committee and managing partner at Jenner & Block, joined the Chicago office of McGuireWoods in 2001. McGuireWoods started out here by taking four lawyers from Gardner, Carton & Douglas LLP in 1998. And the magnet of branch offices doesn’t stop pulling after the new office opens, Rubenstein said. “We get calls from branch office clients,” he reported, "who say they are looking to grow to 50 to 100 to 200 in the next three years. The march of out-of-town firms to Chicago began in the mid-’80s, he said, when New York’s Skadden, Arps, Slate, Meagher & Flom LLP opened an office here, as did Cleveland-based Jones, Day. Both are now among the top 25 firms in Chicago based on the number of lawyers in the local offices. Skadden has more than 180, and the Jones, Day roster has surpassed 150. McGuireWoods now has about 170 lawyers here. Greenberg, Traurig said late last year that it had nearly 90 lawyers here. Duane, Morris LLP, a Philadelphia-based firm which opened its Chicago office in 1999 with a group of 11 lawyers from Holleb & Coff, is now up to 36 lawyers. Holleb & Coff also lost two other key lawyers the same year to the new Chicago office of Greenberg, Traurig, and shortly thereafter folded. Chicago’s advantages, she said, are excellent lawyers, “a lot of business,” and central location. “I advise them to come in with a splash,” Hagen said, “by acquiring a well-known group” of Chicago lawyers. “You need the momentum that creates to keep building your office and attract other lawyers to the new branch office,” Hagen said. “I typically have advised firms that contact me to make their best effort to enter” by means of a merger or acquisition of a Chicago firm first, Rubenstein said. Hiring one lawyer at a time to start an office is too difficult, he said. Another advantage to a merger or acquisition, he said, is that the office begins with a group where the personality conflicts and legal conflicts have probably already been worked out. In the jungle of law firm competition, every new branch office in Chicago probably won’t succeed. Rubenstein recalled five that are no longer here. Akin, Gump, Strauss, Hauer, Feld LLP out of Washington, D.C., closed here in 2004, he said. Luce, Forward, Hamilton & Scripps LLP from San Diego closed their office here in 2001. Others that tried Chicago and left, he said, were Oppenheimer, Wolff & Donnelly LLP, and Robins, Kaplan, Miller & Ciresi LLP, both headquartered in Minneapolis, Rubenstein said, and Dickinson, Wright PLLC out of Detroit.